Tone 2 represents Duality. We began in Unity as 1. In the womb, we first experienced ourselves as One and All with Everything. Then we heard a Voice expressing thoughts that weren’t our own. We realized there were Two. We Awakened to the Consciousness of our Self, apart from the One. Each 13-day trecena follows the same path of Awakening. Through a Blessing of Ascension and Higher Consciousness, we begin a New Life that Begins Again from Higher Ground. Our Lives are a never-ending cycle of Re-Creating our Self. Sun/AHAU shared its Identity as a Cauldron of Creation. IMIX presents the Dawn of a New Awakening. IMIX nourishes us. The glyph illustrates a jar that holds the nourishment from the Mother’s Breast. IMIX ignites our Consciousness and Feeds our Soul. Each 20-day uinal represents a context of Time and Place in the full harvest cycle of Creation. In the 3rd uinal we emerge as the sprout. One sprout looks like any other. The Movements we Choose by Intention in the world above will Define our Identity. Everything we can Imagine is a Possibility. IMIX is said to be the Mother of Innovation. We can wipe our slates clear of everything we know, and begin again from our own First Divine Inspiration To Be. IMIX is the Alpha, the Divine Mother of Compassionate Love. The Crocodile illustrates the primordial aspects of IMIX. The Crocodile is fiercely protective of its young and holds a single-minded purpose to raise them to maturity. As a primordial Mother, the Crocodile emerges from the deep onto dry land. IMIX exists as the Womb of Creation, the Creative Void from which Unlimited Possibilities are drawn. Human sees the world through the filters of all our Perspectives. We measure Dreams by past failures. We unconsciously project old perspectives on what we see. The mind works so seamlessly and efficiently, our own Truth is the first data we process by default. Our Perspectives are Changed when we train our eyes to the Light. We can create in any realm of Being. When we are challenged by dark thoughts, we could run to the window and look at the Sun, carrying out a physical demonstration of the Divine Illumination we are seeking in Spirit. Mother Earth is the Mother that always reflects the Evidence of Light. We can see what Love has Created in every living thing. We create our own specters of reality, projected from the last truth held in our memory. Our Freedom to be Creators is a process of replacing unconscious thoughts that skew our perspective, with Conscious Thoughts we choose. Deer taught us to Uphold the Pillars of our Dreams by being Vigilantly Conscious of our thoughts and filters, and Intentionally Replacing the Darkness with the Light of a Divine Discernment. ALL the Day Signs are the All-in-One of Sun/AHAU. Each one shares a different Divine Perspective. These Archetypes are states-of-mind and Perspectives we can try on. Human’s process of comprehension is Duality. We learn by comparing one thing to another. Each day we are given a Divine Perspective we can compare to our own thoughts. They help us identify the unconscious perspectives and filters we can’t see without a new idea. Through a Divine Perspective, we see something Higher, something More that we Can Be. We find all our own Best Answers within our Self. IMIX is the Dawn of a New Awakening, the Discernment of a Choice of “I Am.” Moses asked to Know the Name of God. The Answer was, “I Am, that I Am.” The Maya’s closest name for God is the Hunab Ku, which symbolizes “everything that ever was and ever could be.” They mean the same. The Creator is all the things that “I Am” can be. The Elders always guided our Consciousness to these words, “I Am,” as very sacred words that should Always be spoken Intentionally as a Conscious Discernment. “I Am” are the words that claim who we are. We Create what we say Is So. We’re Awakened to a Dream of Choosing all over again whatever we’d Love To Be. IMIX feeds our thoughts with “what we could be.” Like any Divine Mother, she sees the Light in us and shares all the Divine Ideas and Inspiration of the Creator to Ignite our Imagination. One of the ways I picked up from my own Mother was embellishing bright ideas, with all the possibilities that could come out of it. I can see her Intention to support my Dreams. Because she was Human, at the time, it was hard to discern she really believed them. IMIX is a Divine Mother that can do it perfectly. The “Divine Way” is probably leaving the Spark alone to shine its own Light. I was never inspired by Mom’s ideas. We WANT our wild ideas to be ALL our own Expression. IMIX also teaches us Compassionate Love. It’s a Love willing to bear the wounds of Not Being Seen. Only an Awakened Mind will see the Divine Intention that Human couldn’t carry out. IMIX’s Instinct is the Duty of Love, to carry on to the Destiny of Divine Justice. IMIX remembers the Love at the Beginning is Promised to the End. One of the lessons of life is stepping into the shoes of the Elder. Our Choices must reflect the Wisdom of our Experience. We could be remembered as a bad example and still reflect a Spark. We are growing toward the Maturing of Choosing by Divine Discernment, instead of being Ruled by our Emotions. This is the fundamental Truth that applies our Sacred Right of Choice. We are learning to applying what we Know is the Wise thing to do. We can learn to stand on the Truth that Love is always Seen and Acknowledged. Love will wait. In my 20’s I was introduced to a woman who was a professional handwriting expert. She made a career of discerning and authenticating handwriting in legal cases. It inspired some personal interest and research on personality traits that manifest in handwriting. One article discussed penmanship as a diagnostic in mental illness. Illegible penmanship was one characteristic of mental illness. Patients were assigned the task of writing a journal “as if” it was written by the Happy Self they’d like to be. The most striking result was the improvement in their handwriting. They by-passed all their filters by identifying as something other than their own troubled perception of themselves. Sun/AHAU encourages us to suit up for the challenge. We’re to start out wearing the full armor the Master wears, so we can imagine it of our Self. When we follow the Sun, we are guided to step into the shoes of an Identity bigger than our Human Self. We can manifest anything we can imagine. IMIX is typically a mentally active day. It’s noted for “wild ideas” and imaginings. There is a unique quality to these thoughts as random and “out of the blue.” Through Vigilant Consciousness, we’ll notice these thoughts are not our own. They will interrupt our own train of thought. We all hold the Spiritual Gifts of Knowing. The Communion of Spirit is so common, our Divine Correspondence is easily overlooked or passed off as our own thoughts. A Mother intent on teaching us to use the faculties of our Consciousness, makes the dialogue clear enough for us to make the Discernment. If we pay attention, we’ll be able to identify “wild ideas” as not our own. Our Consciousness is always One with the Creator. Only our bodies look separate. IMIX can help us identify a Spiritual Gift of Genius. IMIX can share information about our dreams that comes out of thin air. As well as presenting wild ideas, we may have the wild experience, of suddenly Know Something very clearly, that we were trying to figure out before. IMIX shares the resources of All Possibility. Today, Tone 2 presents us with a Choice, the Discernment of what we want to be. Tone 2 is the Choice, “To Be, or Not To Be.” It all comes down to a simple Choice of who we will Intend to Be. We can Intend to Be anything we Want to Be. The more we want it, the better. IMIX opens our mind to recognize a Divine Relationship, so that we can Believe in the Choice we Make. Offered All Possibility and Unconditional Love, any Choice we Love will be Divine. No matter how broken the Human Creation might be, the Creator is the Author of Love, and everything Created for Love will be perfected for a Divine Signature. IMIX resides in the East, the Place of the Sunrise and our Source of Life, Light, and Happiness. Red is a “Light” Day Sign, marking a day of Incoming inspiration. East holds the Element of Fire. Fire holds the Power to change things by transmuting them from one form to another. This is a day to take note of all our wild ideas. They don’t have to make sense. Like a muse, the Creator sends ideas to Spark our Imagination. Turning to the Dreams inspired by the thoughts, we’ll identify what we’re naturally inclined to Create. The Dream is already Known in our Heart. The Dream will be projected onto the wild ideas. We really love to think about wild ideas. When we see our own Dream as Pure Genius, we’re Happy when we engage the Tools of Creation, thoughts of our Hopes and Dreams. Creation expresses the Love of Being. When we Create, we Invest Love in an Idea. The Process of Creation detaches Human from the worldly filter. We forget the world when we’re engaged in the process of Creation. We’re engaged by Divine Sparks of thought. By Definition, a New Creation will draw our thoughts from thin air, instead of the filters of something we created before. Pay attention to your wild ideas. Write them down. Try to remember what you were thinking when the idea presented itself. Don’t try to figure it out what it means. Just draw your consciousness to the experience. Allow IMIX to offer ALL her ideas first. What you don’t know today, can all come together in your dreams. Sun/AHAU challenges our Bravery. Standing on the Creator’s Signature can be turned into a Spiritual Tool. In times that I was afraid of my Steps of Creation, I imagined everything carried out from Above. I remember asking for a loan when the children were small. I didn’t know how to ask or what to say. I applied a Conscious Filter of Divinity. I claimed that regardless of the words that would come out of my mouth, a Divine Voice would Deliver the Message. I sat across the desk of the loan officer, Believing the Creator would Intervene. I must have Believed it enough, because this Tool has never failed to manifest outcomes Higher than my Human expectations. IMIX is the Cauldron of Creation with all the Sparks flying in thin air. Imagine reaching in to pull out one of all the Sparks flying. When you open your hand, there is the very Spark of Possibility you hoped you’d find. The Sparks of Love we wished on Stars and Birthday Candles were magnetized to our Hand. To all my relations, may we cast all our old Dreams to the Wind. May we turn away from an old “I Am” by Defining Who We Are as a “New” Creation. May we create a Dream starting from scratch. We can Consciously throw all our old ways and means into the Air and Ask the Creator to draw them together in a wholly new way. As Creators, our Human mind is the Artist, the one who carries out the work, then is never 100% satisfied with the Expression. May we see the work of art that we would dream to create, imagining the Human Hand laying down the strokes as Inspired by a Hand Above. May we Know that the Creator’s Signature of Love is what will be Seen in the Eye of the Beholder, because it was Intended to be the Beauty of Divine Will. May we Receive our Wild Ideas as the Nourishment to our Mind, Heart, and Spirit. May we offer our Gratitude for a Creator who looks upon us with Compassionate Love, like a Mother who can hardly look away from the Beauty of all we were Divinely Created to Be. May we Know every Choice we make for Divine Will, ends in the Highest Manifestation of our Dream. LUNAR ECLIPSE IN LEO: I’ve updated the Astrology page with a correction on the dates to January 20-21, 2019 (today or tomorrow, depending on where you are). Eclipses complete a cycle of experience and transformation. Today, in synchronicity with the Tzolk’in, a New Light is born to Reflect the Sun. 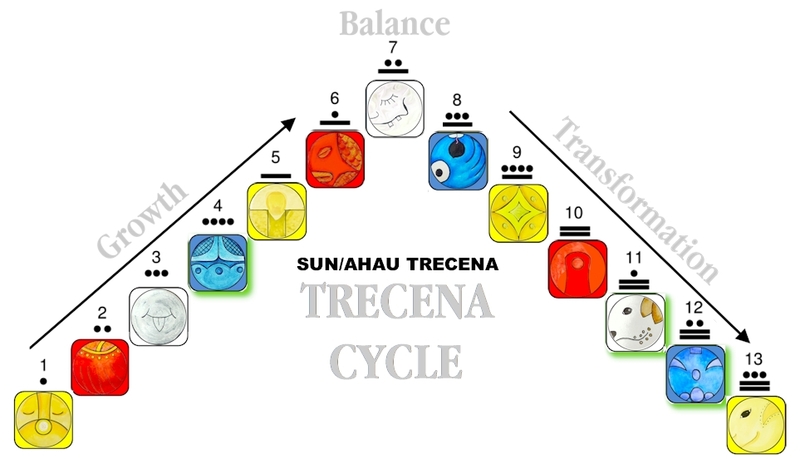 Visit the 13-Day Trecena Guide for a trecena energy forecast and insight on the 3rd Uinal and Portal Days of the Sun/AHAU trecena. Cherokee Turtle/ DAK’SI I’SB: Turtle Island; direction East. The Turtle Constellation Orion, one of three stars in the Cosmic Egg. In Mayan is the Cosmic Hearth. Turtle is the Energy of Creative force at the one-on-one, personal level; dawn, awakening, birth. The beginning of each new era, this star in Orion appears with the rising Sun, heralding the creation of a new World cycle. Sat NAM! 9 Eagle Debra! Thank you for another wonder-filled piece! So I see a desk…”I am THAT, I am”…then I see a plant…”I am THAT, I Am”…then I see a cloud…”I Am THAT, I Am”….and so forth. Even after only a couple times doing it, the meaning of that timeless statement becomes MUCH clearer to understand…to me…which is to suggest, as The Hunab Ku embodies…that “God” is everything and everywhere at all times…and that each of us is THAT same energy…which is The Creator/Creative Force of The Universe.